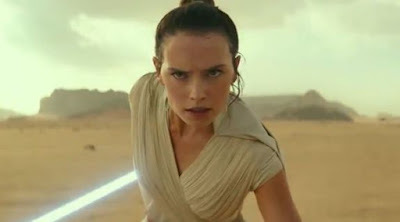 The Trailer For 'Star Wars: Episode IX- The Rise Of Skywalker' Is Here! With the kickoff of Star Wars Celebration, we were all hoping/expecting that Lucasfilm would drop at least the official title to Episode 9. And if we were lucky, we might get some footage, too. Well, we were indeed VERY lucky because we got both. The end of Skywalker Saga comes to a close with Star Wars: The Rise of Skywalker, an ironic title but an undoubtedly cool one, too. JJ Abrams returns to wrap up the trilogy he began with The Force Awakens. Along for the ride are Daisy Ridley as Rey, who is the first character we see as this teaser begins. She's joined by John Boyega as Finn, Oscar Isaac's Poe Dameron, Adam Driver as Kylo Ren, Mark Hamill as Luke Skywalker who is presumably a Force Ghost (although perhaps not?? ), and Carrie Fisher as Leia Organa in scenes completed with old footage. Also expect the return of Kelly Marie Tran, Domhnall Gleeson, Lupita Nyong'o, Billie Lourd, and Billy Dee Wiliams as Lando Calrissian. We get a glimpse of Lando back at the command of his old ship, the Millennium Falcon, in what is sure to be a bittersweet moment for fans still missing Han Solo. Events pick up years after the events of The Last Jedi, with the surviving rebels rallying for a final battle against Kylo Ren and the First Order. Based on what we see here, Rey has embraced her destiny as a Jedi, the spirit of Luke Skywalker seems to be with her still, and an evil cackle at the end suggests the Dark Side may still have some sway.